De La Salle University College of Law (DLSU COL) was named the Top 3 Highest Ranked Team in the Global Finals of the Foreign Direct Investment (FDI) International Arbitration Moot competition held in Boston, Massachusetts last November 2 to 5. 104 schools worldwide were part of the competition. Two oralists from DLSU COL Julia Pineda and Rob Concepcion ranked 2nd and 3rd highest advocates respectively for the competition. The team received support and instruction from the DLSU College of Law and were coached by two international law practitioners Foreign Attorney Dr. Harald Sippel and New York Attorney Amanda Lee. The FDI Arbitration Moot is an annual competition organized by the Center for International Legal Studies in cooperation with the following founding institutions: Suffolk University Law School, Boston, Massachusetts (FDI 2017 Host School); Pepperdine University Law School Malibu, California; Centre of European Law, King’s College London; and the German Institution of Arbitration (DIS), Frankfurt/Cologne, Germany. 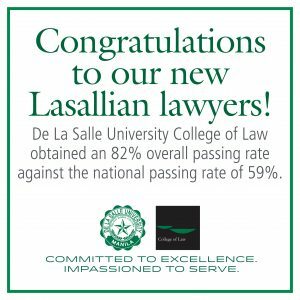 The De La Salle University College of Law (DLSU COL) obtained a bar exam passing rate of 82% against the national passing rate of 59.06%, the highest recorded passing rate in 30 years. The newly minted Lasallian lawyers are Ace Aceron, Ma. Regine Agdon, Gem Alegado, Rosa Alfafara, Roque Alvaera, Tanya Andrade, Jazem Ansama, Janna Aquino, Jimi Arranchado, Mila Asiddao, Rhonaliza Burce, Eunice Cajayon, Zoiline Calso, Kristine Calugay, Jeanne Castillo, Leandro Celles, Anjelica Chiongson, Patricia Cruz, Bien De Guzman, Mirriam De Lemos, Marvin De Leon, Regine De Los Reyes, Jan Del Castillo, Jon Diaz De Rivera, Keren Dinaque, Klaire Esden, Czarina Eseque, Maria Figeroa, Edison Flores Jr. Ma. Lorenza Galang, Gelene Guevara, Esteele Hiceta, Philip Kintanar, Renante Ko, Jualie Lantingm Eusebio Lee, Agatha Macalalad, Hector Macapagal, Leah Maligaya, Atom Maronilla, Wilfred Martinez, Mary Mationg, Frederick Mayuga, Charm Medina, Christopher Mercado, Ma. Christina Mojica, Jerome Morada, Sheena Morales, Glenda Ozaeta, Ernesto Palomique, Edgar Pamis, Jerraemie Patulot, Charity Pedrajas, John Ramirez, Gianna Remo, Gabrielle Ricolcol, Mae Sandoval, Ysabel Santos, Jelena Sebastian, Emmanuel Eumir Songcuya, Leonard Syjuco, Sonia Tamondong, Sarah Tan, Hency Tanbengco, Andrew Tiu, Armon tolentino, Norman Velasco, Marian Yambao, Regine Yu, Anna Zaide, Alyssa Zapata, and Danna Zerrudo. Established in 2009, DLSU COL is one of the youngest law schools in the country. This is the college’s 3rd participation in the bar examinations. The DLSU Juris Doctor (JD) program offers a multi-disciplinary approach to learning, developing in law students the research and communication competence to practice the profession. The DLSU Juris Doctor (JD) program offers a multi-disciplinary approach to learning, developing in law students the research and communication competence to practice the profession. Coupled with the University’s tradition of excellence and service, the program instills in tomorrow’s young lawyers the compassion and commitment to uphold the rights of the individual, the protection of the environment, and the passion to transform lives–most especially the poor.